If you follow us on Instagram at all, you will know that we love vintage clothing! You may also remember me blogging about the benefits of dressing kids in vintage clothing, especially related to finances. 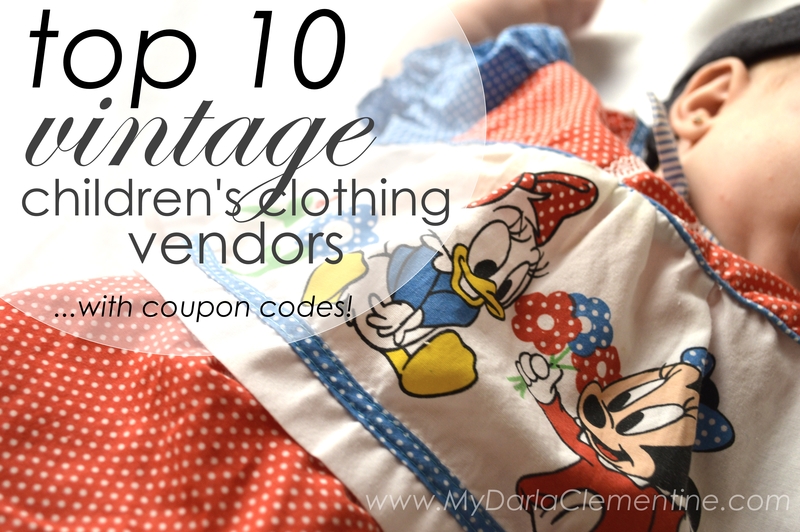 Well, today I’d like to give you a list of ten of my favorite vintage kids clothes vendors on Etsy that I have either personally purchased items from in the past or have favorited their pieces. These shops are the first place I check when buying clothes for Clementine and Darla as their prices are spot on (average $5-12 per item), and the shipping is very quick and reasonable. These amazing sellers have also been generous enough to offer coupon codes for My Darla Clementine readers, so the price side of things just got even better! Remember, their stock is always changing since each item is one-of-a-kind. So if they don’t have things you are interested in now, don’t rule out checking back later! Connect on social media: Instagram, She also is working on Missmyrtlevintage.com which will be up & running within the next couple of months. Click in now to sign up for her email list! Notes: Go to her shop section “Babies and Children” to shop for kids’ clothes, but be sure to also check out her vintage stationary, housewares, Christmas stuff, and clothes in grown up sizes too!! Notes: Check out her shop section called “wear” for kids’ clothing. She also offers vintage books, games, kitchen wares, decorations, and more! Connect on social media: Here is the shop’s Instagram, as well as the owner’s personal Instagram account. Notes: Visit shop section “Children’s Clothing,” or take a peek at the vintage clothes she sells for adults as well as housewares up for sale. Notes: The bulk of Brooke’s shop is vintage kids clothes (meaning she has a wide variety of sizes) so sections like “Sweaters” or “Overalls” are specifically related to kids. You can also find a few women’s pieces and housewares. Notes: All of her clothing is for kids and each shop section is broken down by age, making it really easy to find the right sized pieces for your littles! Notes: Her kids’ clothing is broken up into shop sections like “Peppermint Baby,” “Peppermint Boy,” and “Peppermint Girl.” Holiday pieces and retro collectibles are also listed for sale. Definitely a must-see shop… She’s been featured on a lot of blogs & websites! Notes: Shop is broken up into sections like “Boys,” “Girls,” and “Shoes and Accessories.” Shop also features books, toys, and housewares. Coupon code: You don’t need one! Her prices mostly fall between $2-$5… That is cheaper than Goodwill! Notes: She only sells vintage kids’ clothing, making it easy to navigate through her store… and it is all super cheap! She explained her philosophy to me, “…as a single mom I am always looking for good prices on vintage. I wanted to be that shop that I’m always looking for. Cool vintage at decent prices.” She has certainly achieved that goal – now go show her some love! Notes: Select “Babies…….Kids” section to shop for your littles. They also sell vintage clothing for men & women, and best of all they have a “SALE!!!! !” section. Notes: Click on the “Clothing” section to see all of her kids’ wears. Also for sale are vintage books, housewares, toys, etc! Hope you enjoy this list and find lots of great buys! Let me know how your shopping ventures go in the comments below!